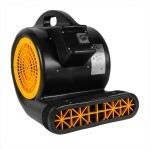 This water vacuum easily cleans out flooded areas of water and other undesirable liquids. It has a pump out system built into it, to pump out up to 30 gallons per minute. It can handle recovering large volumes of water, sludge or solids, that may have stones, dirt, and other objects up to 1/2" in diameter in it. Inside the recovery tank is a rust proof steel basket that catches all large objects before they enter the recovery tank. This allows just pure liquid to pump out the machine to a drainage area. We recommend when recovering large jobs to check the recovery basket every 15 minutes to assure it is free from obstructions, and not full of material. We do have other models available in our flood water extractors section, if this model does not need your individual needs. This machine comes with two 50' hoses for recovery and dumping, and 12" squeegee wand for cleaning those smooth floors. Machine housing offers easy internal access to all components. 1/3 HP auto dump pump out motor has a vortex impeller and epoxy coated cast iron housing. Vacuum motor is manufactured with a steel fan cover and aluminum fan blades with double ball bearings. Recovers water & debris up to a 1/2" in diameter. Designed specifically for restoration & flood water recovery work. 30 GPM flow rate allows you to extract large areas quickly. Two 50' hoses offer you adequate coverage to recover and dump in a designated drainage area. 12" double squeegee recovery wand is great for recovering on hard floor surfaces. Fiber composite body makes it lightweight and durable. Cover lifts up for easy access to flood pumper vacuum motor. Recovery Hose - 50' x 1.5"
Dump Hose - 50' x 1.5"
My crews fight over the Clean Freak Flood Master. We have two other flood pumpers made by other companies, the Clean Freak Flood Master is hands down the better product in both production and ease of use. Great product, price and quick delivery. Used this machine a few times now & it has done a good job each time. Comes already assembled and ready to go. The only thing I would like to see different is a storage area for hoses so I can leave it as a crash cart that is ready to go when needed. Powerful pumps in a manageable size. Shape factor makes it easy to transport and store away. Most recent use was New Years Eve when a customers hot water heater burst....this pumper made short work of the mess. The two 50' hoses are nice but rarely needed. Four 25 footers (with couplings) would be perfect! 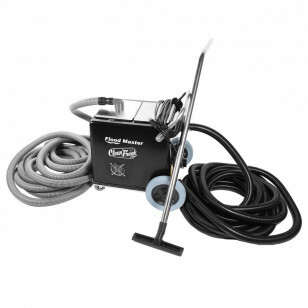 This is a review for the CleanFreak® Flood Master Water Vacuum with Pump Out System.